The CROSSMAKER ULTIMATE GIFT SET is one of See The Lights most popular gift sets! It’s perfect for the children to enjoy in celebration of Resurrection Day. During the month of February and March the Crossmaker Ultimate Gift Set is only $25.00 which includes FREE SHIPPING for US residents. 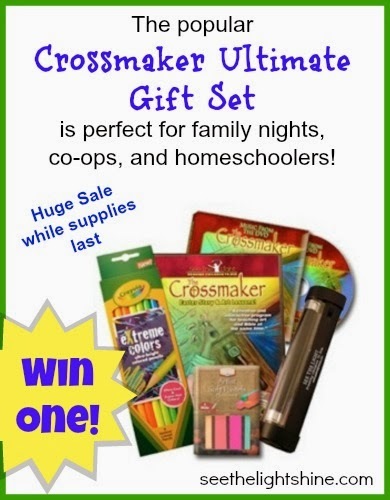 See the Light wants (1) family to have their very own Crossmaker Ultimate Gift Set. They will be picking a random winner on February 17th at 12a. All entries will be verified. Have you entered the Crossmaker Giveaway yet? There's still time! They all look great, but probably the Gift of Love! Looks great, I'd love to win it! Is it open to residents outside the US? If so, consider me in! Almost forgot the answer to the question - my choice would be the Gift of Love!